Hello! Today I have my unboxing of June's MeeBox for you. If you missed last months, you can find it here (you can also see my swatches here, and nail art look here). This months theme is Splash, and was announced as a special indie takeover box. We were told that the collaborating brand was a UK indie, inspired by history and magic. I guessed A-England - and I was right! Read on for a closer look at everything inside. The first polish I pulled out is 'Whispering Waves', a bright turquoise holographic. This is a very popular shade, and I can see why! It is amazing. At certain angles it has has a bright pink flash to it. This might be my favourite this month. Next is 'Gloriana', a rich red full of gold flakes. Unfortunately I already have this but somehow still haven't tried it! It looks gorgeous none the less (very 'fireball-y'), and now I have no excuse to finally wear it. Last up is 'The Blessed Damozel', a deep purple metallic. Again, this is absolutely gorgeous. It almost looks marbled in the bottle, I love it! My boyfriend has picked this one out as his hands down favourite this month. 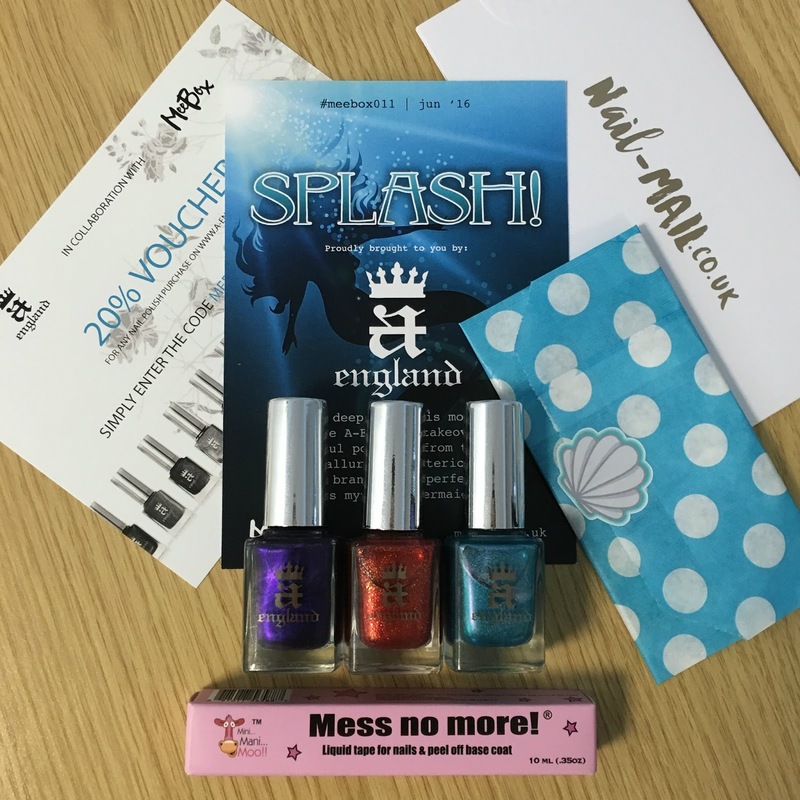 The first extra this month is a bottle of Mini Mani Moo 'Mess No More!' liquid latex (I love the blingy lid!). After a quick test it peeled easily, and smells quite nice. I'm currently using latex from eBay which smells awful so I'm happy to try this instead. Also included were two bags of charms from She Sells Seashells - one of silver starfish, and one of gold shells. 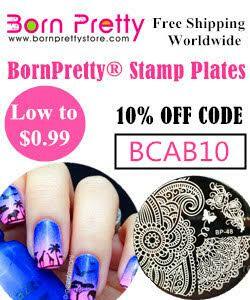 These would be the perfect addition to any beachy or mermaid mani. Lastly, we received some mermaid scale nail vinyls from nail-mail.co.uk. We've had various vinyls from nail-mail in previous boxes, and they have always been good quality and easy to use. What do you think? I am so impressed! For the second month in a row we have received six items instead of the normal five - and you can see the inspiration for each and how it fits into the Splash theme. I also loved the whole takeover idea. I've only worn one A-England polish before, so I'm excited to try a couple more and get a better feel for the brand. That box looks wonderful. Those polishes are absolutely gorgeous. Ohhh this Deffo stands out as the better of the nail monthly boxes, very mermaidy, fishy, love it! Wow, awesome that it was an A England collab box! All these colors are fantastic-- I really need to catch up on her releases! I've fallen behind on aEngland polishes...and I regret it. This box is so worth the money!